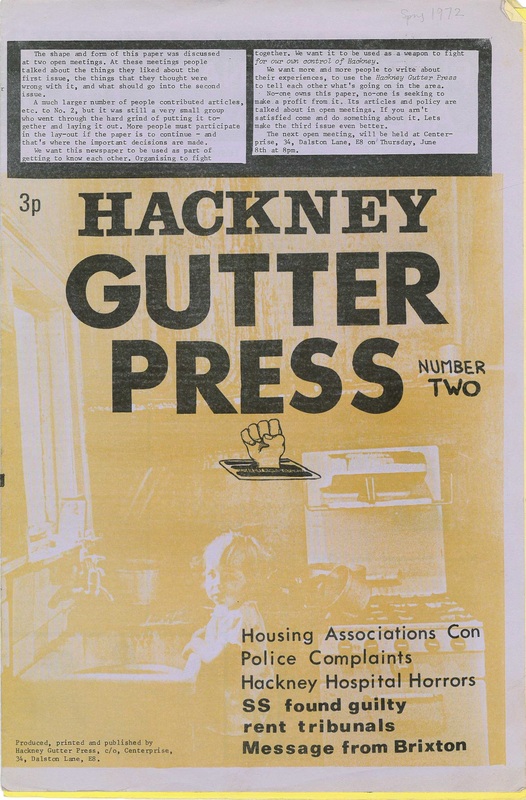 The Hackney Gutter Press magazine seems more confrontational and subcultural than Hackney Action, which was being published at the same time. Gutter Press articles were sarcastic and sweary and already assumed a certain amount of scepticism of “the pigs”. I have four issues (I’m missing issue 1) which all seem to have been published in 1972. (It seems that there were at least six issues in total.) Each of the ones I have is slightly larger than A4, with either 12 or 16 pages printed in a variety of coloured inks on paper in various colours. This has slightly tested my scanning skills, so apologies in advance. Planners, Tenants and Bulldozers – Hackney Council proposing to knock down over one hundred houses in Sandringham Road, Downs Park Road, Cecilia Road, Ferncliffe Road and Mountford Road – without telling the people living in them (because apparently, unlike their landlords, they had “no interest” in the properties). The Slippery Sands of Housing Associations – “Housing associations were set up by the Government a few years ago as an attempt to do something about the housing situation. It was a situation that appealed mostly to the Tories, as Housing Associations were neither council housing which the Tories don’t like, nor private housing – although they could be turned into private housing later on.” – criticises housing associations for buying up properties and evicting the existing tenants. Second Actel Housing Association and its owner Mr Sands come in for particular scrutiny. *29 Grosvenor Avenue is described as a commune in various reports. Jake Prescott of the Stoke Newington 8 is said to have lived there. It included a radical print shop in the basement. Sexual Planning, Sexual Nightmares – women share their experiences of the dehumanising family planning clinics in the borough. Hackney Hospital Horrors – women share their experiences of the dehumanising maternity and post-natal care in the borough – and campaign for basic stuff like a play room for kids in the ante-natal clinic and longer visiting hours. In summary – a member of Hackney Claimants’ Union tried to take a photo in the dole office and was punched in the face by a social security clerk and his camera smashed. The police came and arrested three Claimants’ Union members. The clerk was found guilty of assaulting a claimant. The charges against the claimants were adjourned. There is more on the case in future issues, as well as other material about the seemingly quite militant Hackney Claimants’ Union… to be continued! In what would appear to be an unrelated story on the same page, a female Claimaints’ Union member was charged with assaulting the police by throwing a piece of chocolate (!) and was acquitted. Collar Your Landlord – tips on taking him to a rent tribunal. 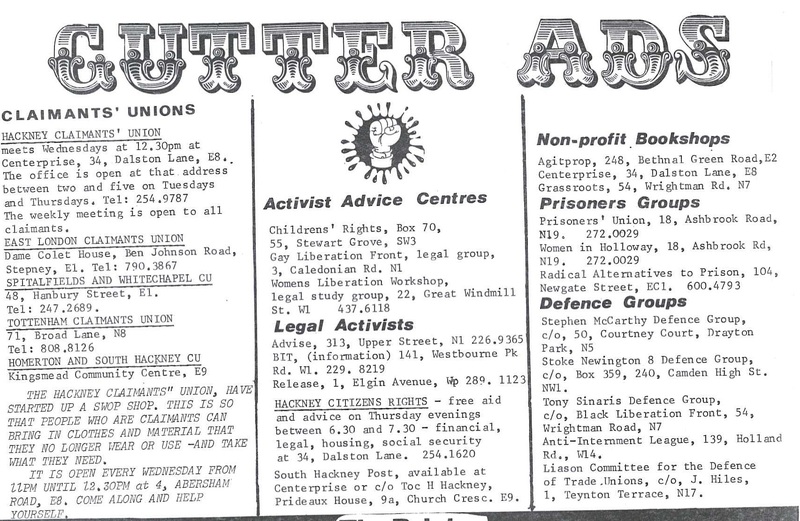 This entry was posted in 1970s, Angry Brigade, feminism, Hackney Gutter Press, housing/squatting, police, uncategorized by ackneyinnit. Bookmark the permalink.